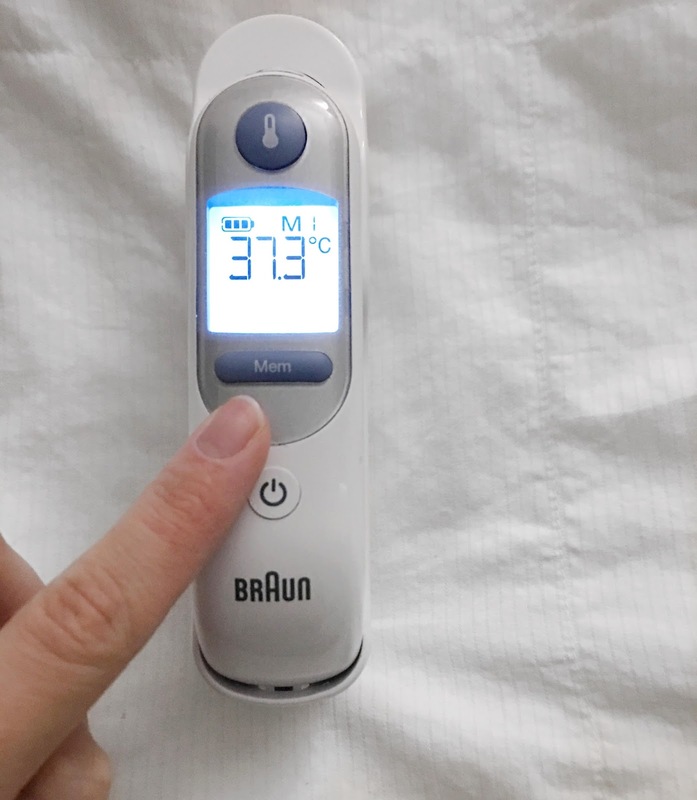 The flu season is here and with full force and using the Braun Thermometer to monitor my baby’s temperature is crucial. The Braun ThermoScan5 has an ExacTemp guidance system that gives me confidence in the device. Having a thermometer that is reliable and accurate is key. It's fast, gentle and easy to use. Lucas has no issues with it unlike if I were to use one orally. He would squirm and whine. Using an ear thermometer makes it painless for both of us! The nice thing about Braun thermometers is that they come with hygienic disposable lens filters so if my husband or I need to use it, we don't contaminate the ear piece. We really like the Braun ThermoScan5 but wish it had the colour-coded display like the Braun No Touch + Forehead Thermometer. The colour display would make it easier for a babysitter or family member looking after the little one to distinguish if they have a fever or not, especially if they don't know the ranges well enough for a baby. The Braun ThermoScan5 also holds onto the last temperature reading just in case it is necessary. Although Bluetooth or "Smart" Thermometers are in trend at the moment, I really appreciate that Braun hasn't made a "Smart" Thermometer. While it is true that the levels of radiation emitted by Bluetooth devices is below what the current regulatory agencies consider “safe”, there are many who question whether their “safe” is really, well, safe. I personally don't feel comfortable having anything Bluetooth near my son’s head or my own! I don't even sleep with my phone by my head. If I do, it's on Airplane mode. A thermometer is one of the staples in a house hold and is perfect for a mama's baby registry or a welcome home with baby gift! You can never go wrong with a thermometer and to be honest, when baby Lucas came home I didn't have a thermometer because it wasn't something I had thought about being a first-time mom! If you're not fond of an ear thermometer, Braun has you covered with the Braun No Touch + Forehead Thermometer. The first and only thermometer with both no touch and touch functions. It uses a new, revolutionary technology that ensures clinically accurate and consistent readings, with gentle convenience. I've demonstrated below with my little one so you understand what I mean by no touch & touch! The Thermometer has a silent mode for sleeping baby and also has a position guidance system, ultra-sensitive sensor and optical system for accuracy. I know, I know it sounds a little intimidating and hard to use but the systems in place make it fast, gentle and easy to use! Using the Braun No Touch + Forehead Thermometer came in really handy this month because Lucas has his immunizations so I got to test both thermometers. 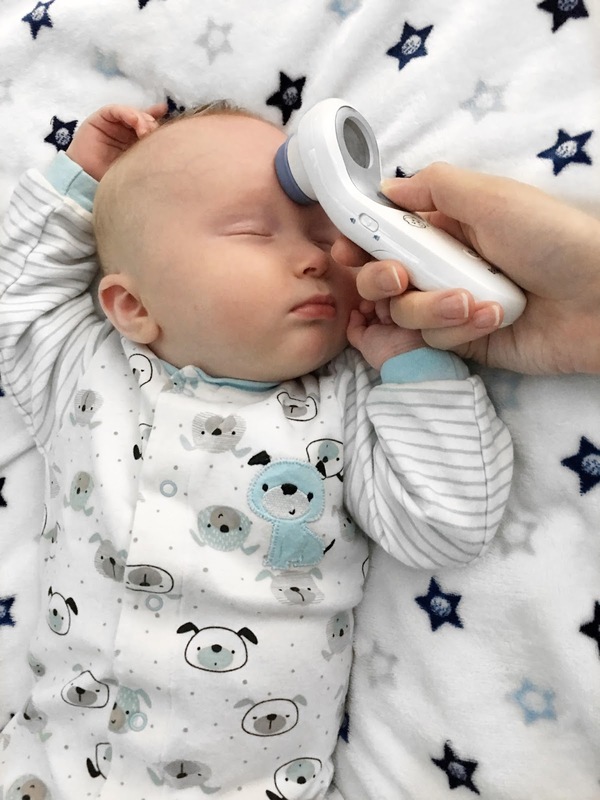 I really liked using this one over the ear thermometer because I didn't have to disturb his sleep while his little body beats the vaccine bugs. Overall, I would highly recommend both devices. Choosing the thermometer that is right for you and your family is a personal choice. 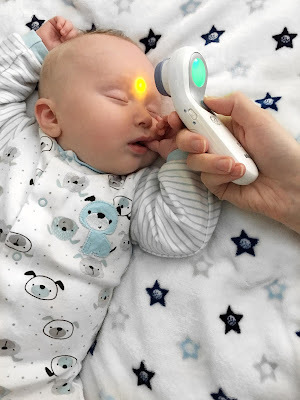 If I chose between the two I would go with the Braun No Touch + Forehead Thermometer because I like that it has the silent function and my son responded better to it…or lack of response since it never disturbed his sleep! Once I use the Braun ThermoScan5 he squirms because it tickles his little ear. You can find the Braun Thermoscan5 and Braun No Touch + Forehead thermometer both available at London Drugs. Thank you for collaborating with me to bring awareness to Braun!